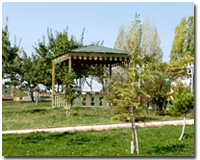 Ankara has many delightful parks and open spaces established in the early years of the Republic. Ataturk was the main reason of this development in the city. Gençlik Park (which also has an amusement park), the Botanical Garden, Seğmenler, Anayasa, Kuğulu, Abdi İpekçi, Güven, Demetevler, Cemre, Kale, Anıt, Göksu, Harikalar Diyari (Wonderland) , Kurtuluş (for ice skating) and Altınpark (Fairground). Atatürk Orman Çiftliği (Atatürk Farm and Zoo) is now within the growing city and is a pleasant place to spend a day. There is a replica of the house where Atatürk was born in Salonica, an excellent restaurant, and some cafes.